Coaches and players love trick plays. 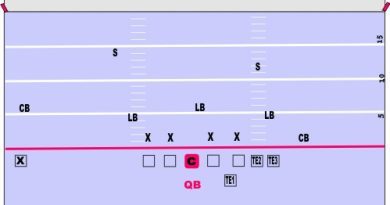 If you are using the I-formation as your main formation, you don’t need to change anything to incorporate a nice reverse play. And it happens so close to the line of scrimmage, that defenders may not notice until it is too late. The QB opens up to the FB (no. 4), just like in the I-Form option play. Fakes the handoff to the FB. The TE waits, for the QB to open up, then immediately comes around the FB and takes the handoff. The tackle can be pulled as above to help with the blocking. Also notice all the lineman are blocking everyone to the right. Of course, the QB and RB have to follow through and continue the play.